As a general rule, in the summer months of June, July and August, you can plan for highs between low nineties and mid one hundreds. Snow is not unusual in the winter months with highs in the forties to fifties and lows below freezing. April, May September and October are the most temperate months with highs generally in the seventies and eighties. 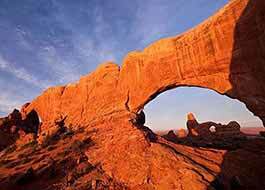 It’s always a great time to visit Arches National Park. Every season has its advantages and disadvantages and every season offers something unique to the experience of exploring the park. 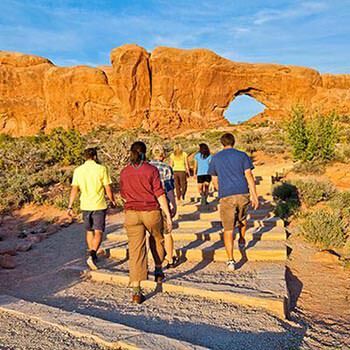 We wish you could pay Arches a visit each season and decide for yourself which time of year is your favorite. Spring brings warm, pleasant days and cool evenings. It’s not uncommon to encounter strong winds or a brief rainstorm in Spring. This time of year makes for pleasant days out of doors and the blooming desert flowers make the phenomenal landscape that much more interesting. Summer is the time for families, kids are out of school and the weather is consistent. Day time temperatures are hot, often exceeding 100 degrees, but the mornings and evenings offer almost perfect adventuring weather. Afternoon thundershowers from July through September can be a welcome relief from the heat. 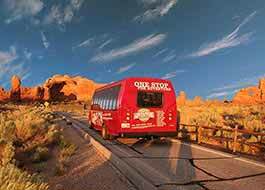 Autumn brings amazing deep, rich colors, not just to the foliage, but also the red rocks.Though October tends to be the wettest month, days are generally warm and pleasant and usually clear skies. 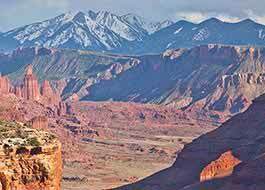 Winter in Arches is unpredictable, weather is either cold and snowy or dry and warm...ish. One thing you count on in winter, snow or sunshine, the park will be peaceful, beautiful, and relatively vacated. Precipitation .33" .75" .78" .47" .86" 1.02" .96" .98"